Try using 3/4 cup whole wheat flour and 3/4 cup all-purpose flour for more whole grains! Morning Muffins freeze well and thaw quickly. Preheat oven to 400 degrees. Lightly spray or oil a muffin tin with cooking spray. In a large bowl mix egg, milk, sugar, oil, carrots, raisins, walnuts and vanilla. In a seperate bowl mix flour, oatmeal, cinnamon, baking powder, baking soda and salt. Add wet ingredients to dry ingredients and stir gently until flour is just moistened. Gently fill muffin cups about 3/4 full. 5 Comments for "Morning Muffins"
I received several requests for beet recipes so I did a trial run on my family and substituted raw shredded beets for the carrots in this recipe. My 7 year old helped prepare the muffins and was thrilled with the pink batter, although the pink color did fade as they baked. My 7 year old and my two teens all liked them. I did use whole wheat pastry flour, replaced the raisins with dried cranberries and added 1/8 tsp nutmeg for a little more depth. 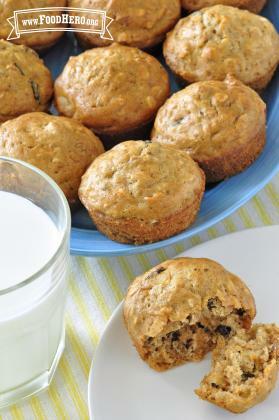 I also added shredded unsweetened coconut to a few of the muffins which I enjoyed. Great recipe! Will try with some grated zucchini next time for variety. Made these as mini muffins. Tasted great at first, but dry out quickly, maybe because of the small size. They are wonderful as long as you consume or freeze them right away! Very easy to make. These are great! You can add any kind of nuts, fruit and veggies! I added grated Zucchini and they came out great.